Product code: ES7919 Categories: Art Deco, Art Deco Rings & Art Deco Engagement Rings. Rings from the Art Deco period often took an earlier design or style and altered it in a unique way such as can be seen here with this incredibly beautiful Art Deco ruby and diamond fancy cluster ring from the 1920’s. Taking the traditional cluster ring to a new level, in the centre is a diamond surrounded by six rubies, However starting with the diamond in the centre, even the diamond has a unique point of difference to other cluster ring. The diamond itself is set into a star design that is further set into with a hexagonal border. Small features such as this go a long way in promoting why there is nothing quite like a genuine Art Deco ring, and why they are as modern today as when they were made all those years ago. And then of course there is the border of rubies that really takes your breath away. Instead of the traditional round rubies, there are fancy half moon cut rubies that really stand out. 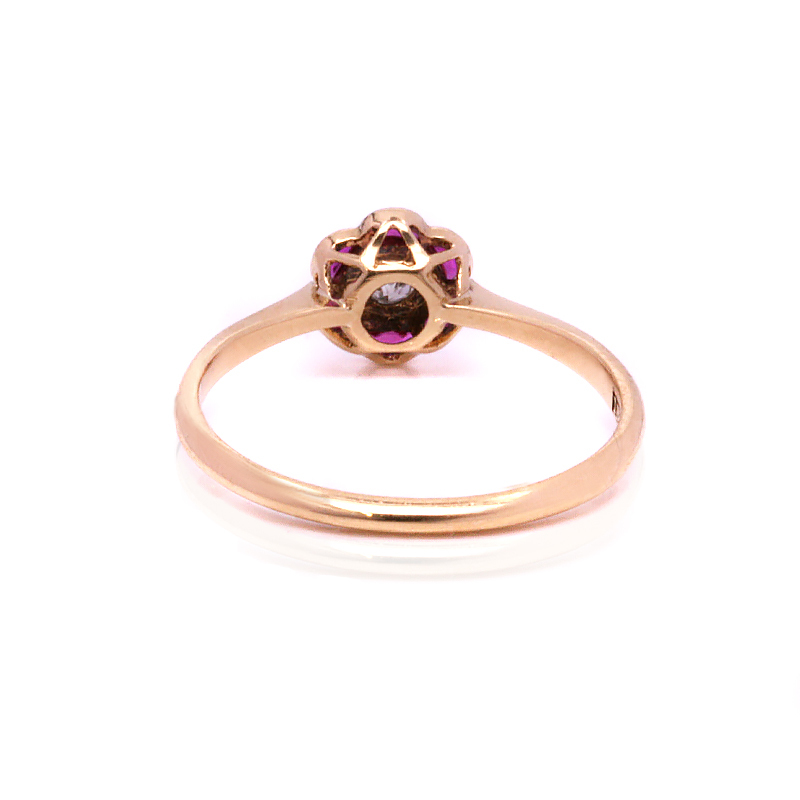 These rubies are just incredible to admire and highlight the beauty of this ring so well. With a total weight of 0.12 carats, there is no doubt that this ring will always be admired and commented on. Measuring 7.2mm in diameter and set on a sleek yellow gold band, this ring will always stand out for its unique style and beauty. This ring was hand made in 18ct yellow gold and platinum. This Art Deco ruby and diamond ring will suit any occasion including making a wonderful example of an Art Deco ruby and diamond engagement ring.